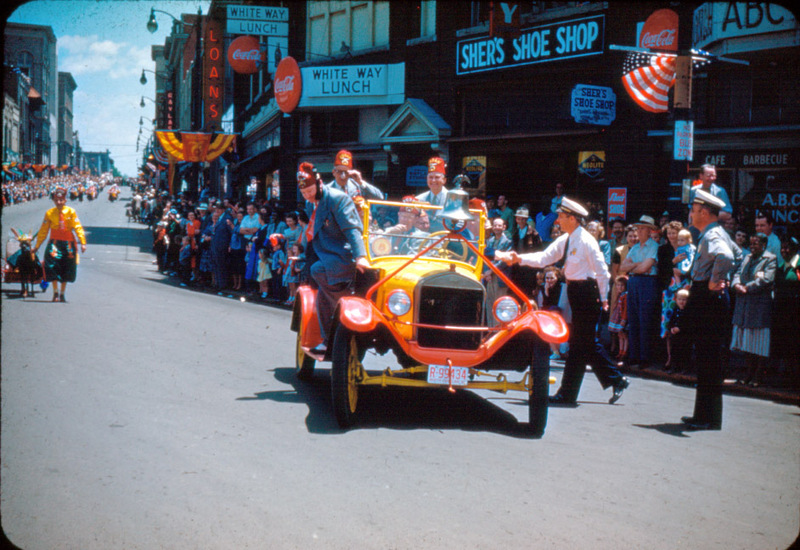 In the years following World War II, America's love affair with the private automobile came into full flower. By 1960, there were finally enough cars so that nearly everybody had access to one. The roads were wide open; we had conquered time and distance. In the heady drunkenness of our new love, our hands and arms grew into the steering wheel and our legs and feet atrophied. We turned our backs on the od, non-automotive way of things. Our house became mere extensions of the garages we built for our cars. We became besotted with the ugly convenience of the highway commercial srip. If we could not park at the door, hwe would not shop. 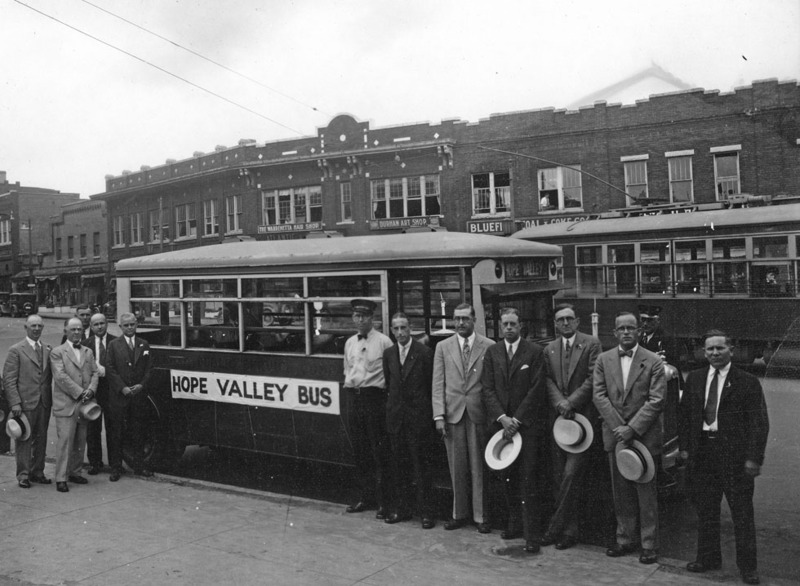 Downtown was not built with the automobile in mind, so we abandoned it. We abandoned not only downtown the place, but downtown the idea. And because the idea of downtown is an essential feature of our social and cultural heritage as ancient as the Athenian agora and the Roman forum, by abandoning it, we placed our identity as civic people at risk. Durham was no exception to the American rule. Our downtown grew sick with all the rest. By 1976, things were so bad, we had begun to try to save the patient by amputating the lifeless bits to provide what we believed would be life-giving parking to the few still-viable elements. Of course, this failed. You cannot save anything by destroying it. The old downtown was gone - dead at our own hands. An entirely new idea was required and, in recent years, a novel and workable construct has emerged. This new concept for downtown is based on two essential principles. The first is people. Downtown must have its own population. It must be its own neighborhood. It can't be just a destination: it cannot return to the department store past. As our roads becorne choked and even acres of asphalt don't provide enough parking, the car is losing its lustre. Time and distance have begun to reconquer us. We need to design places where people can live, work, shop, and play without driving. Downtown is the obvious choice for such a place. The second element is historic preservation. Civic life needs a cultural identity and it is architecture more than anything else that provides this identity. When planning and architecture becomes subservient to the automobile, civic life suffers. The warehouse store and the big-box pharmacy do not bind us together as a people. 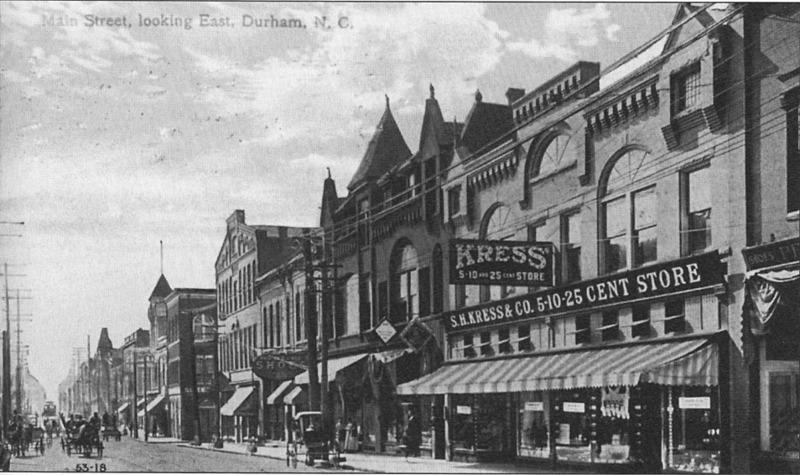 In our old downtown, however, badly used as it has been, there is still a staggering wealth of magnificent buildings working together to provide a cultural fabric that is unique to Durham. The new concept of downtown exploits this richness. The big open spaces of the long-empty buildings tempt new owners and designers to experiment and play with exciting ideas for offices, galleries, resaurants, and residential living. The irreplaceable architectural detail and history of the buildings naturally draw people to them. 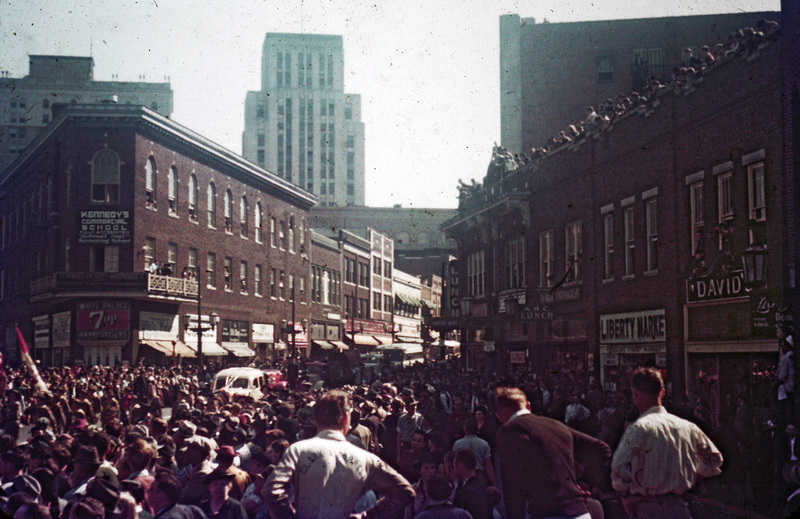 It is not premature to declare that downtown Durham has been saved. To be sure, there are major problems yet to be solved. Here and there, important buildings are still at risk. But the big risk has been overcome. The debilitating notion that downtown couldn't be saved has been defeated. The new concept of downtown has been tested on both a large and a small scale and proved valid. Blue Devil Ventures and the other pioneers whose properties, homes and projects are on tour today have taken the plunge and their success has emboldened others to follow. 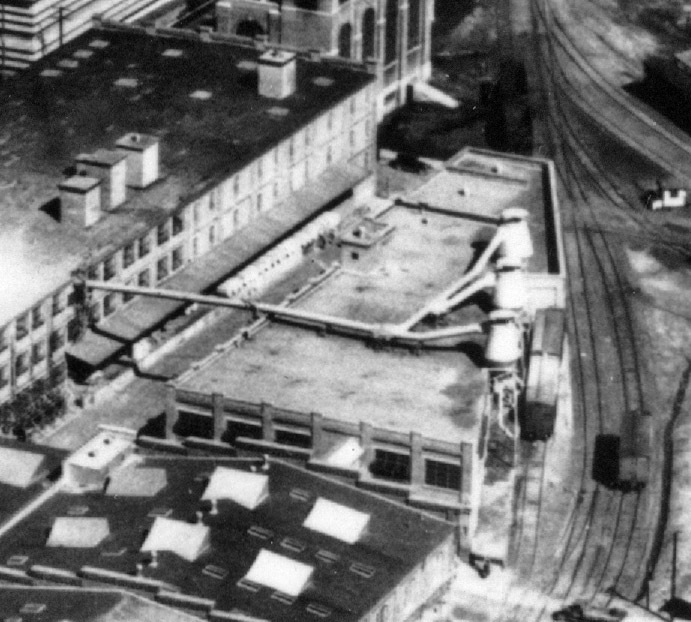 The surest confirmation of the new concept of downtown is Liggett's recent decision not to sell off the last of its historic factory buildings at Main and Duke, but to redevelop them into apartments, offices, and shops. What only five years ago would have been seen as a liability is now one of the company's biggest assets. Cigarette manufacturing may have left Durham, but the cigarette manufacturer-turned-downtown-developer has decided to stay. So, today's tour is a showcase and a celebration of the new downtown, the creation of a new neighborhood, and the preservation of our shared architectural and civic heritage. Our thanks go to the developers, property owners, and neighbors who have not only opened their homes to us today, but have saved downtown for us tomorrow. The Flowers Building is named for William Washington Flowers, who joined L&M in 1911 and became its chairman in 1939. 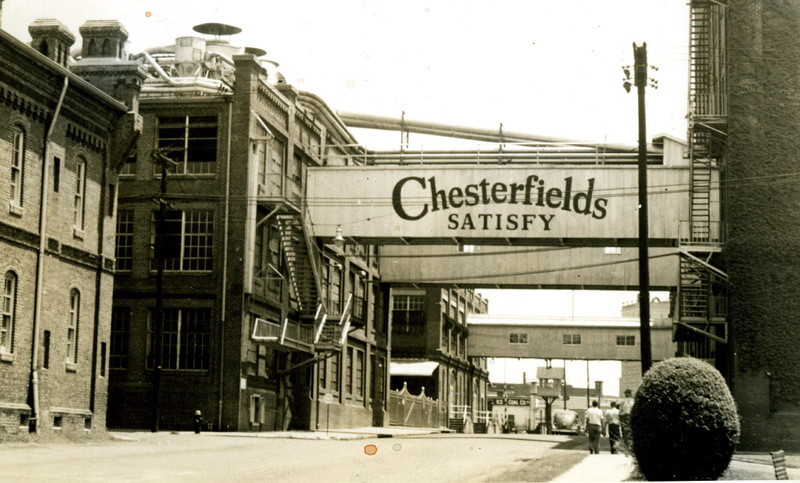 1944, on the left, Flowers in the foreground (with the "Chesterfields Satisfy" bridge) and the Cooper Building in the background. A "cooper" is an archaic term for someone who makes barrels, the preferred storage/transport method for tobacco in the late 19th/early 20th century. That L&M would have a dedicated building just for the manufacture of barrels gives you a sense of the volume of tobacco being produced. 347-351 West Main is part of a row of early 1920s-era row buildings along the south side of Five Points that replaced earlier industrial buildings and frame commercial structures. In 1923, National Dollar Store was the tenant at 347, Noell Brothers Hardware at 349, and Dixie Clothing Company at 351. 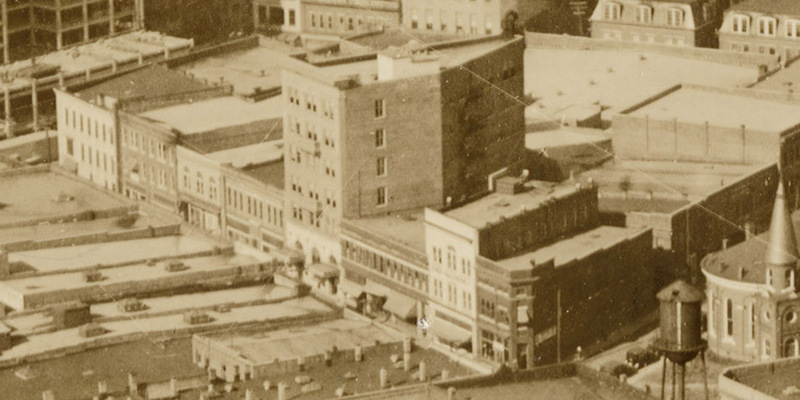 In 1932, Frank Critcher's Produce was at 347, with the Durham Dry Goods co. upstairs. 349 was the Independent Meat Market, and 351 the Joyce Food Store. By 1937, ABC Lunch was established at 347, with the Art Display Co. upstairs. 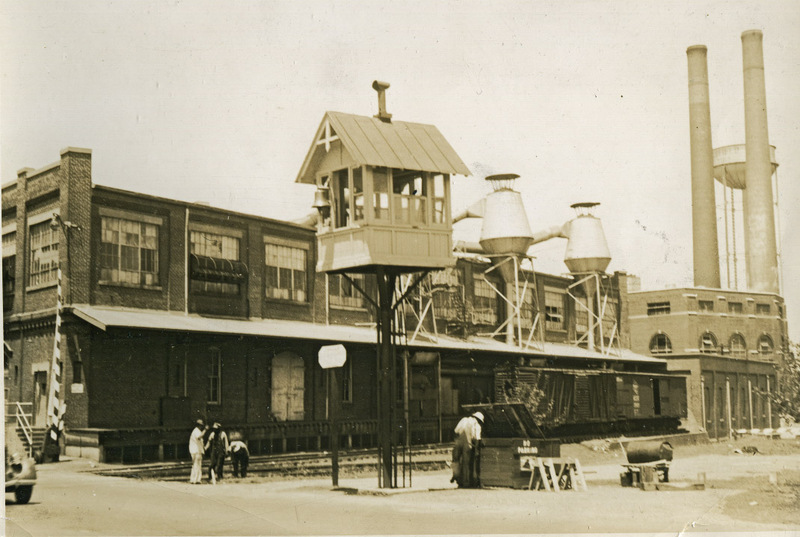 349 housed Chicago Market Co., and 351 Staudt's Bakery. 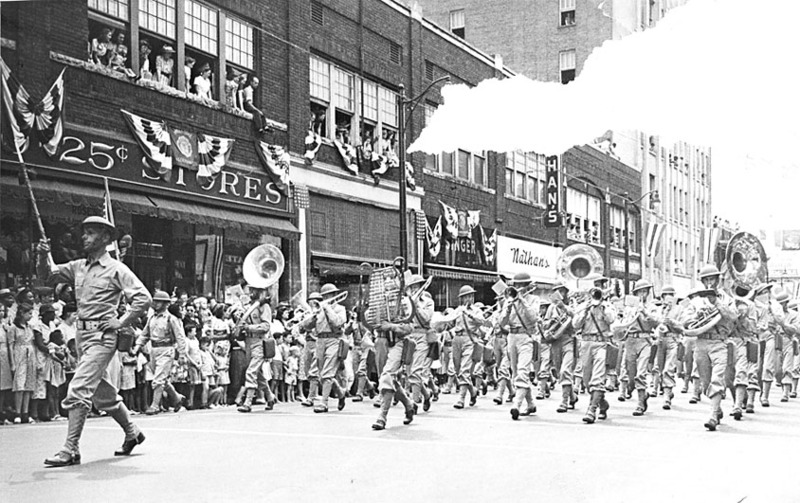 By 1941, 349 W. Main was the Liberty Market, and 351 W. Main was David's, a clothes store. 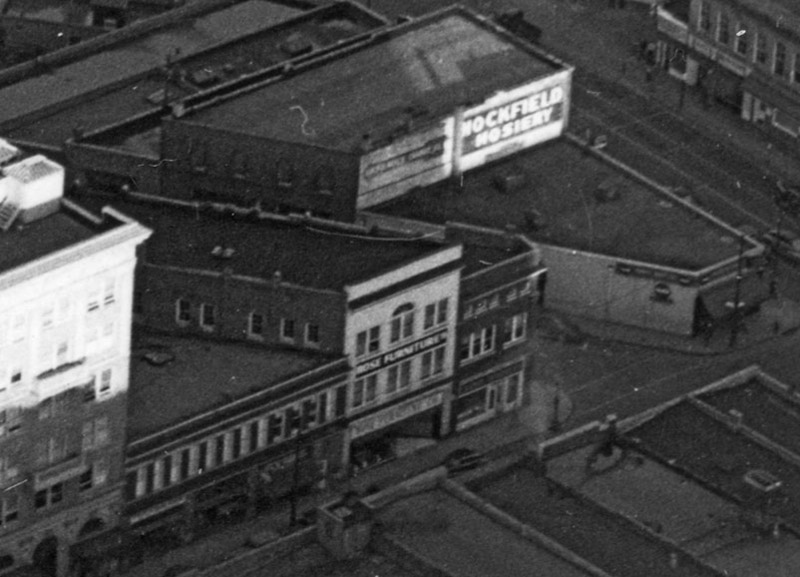 Below, a 1953 view showing a piece of 347 West Main, home of ABC Lunch. Specialties? Cigarettes and sandwiches, evidently. 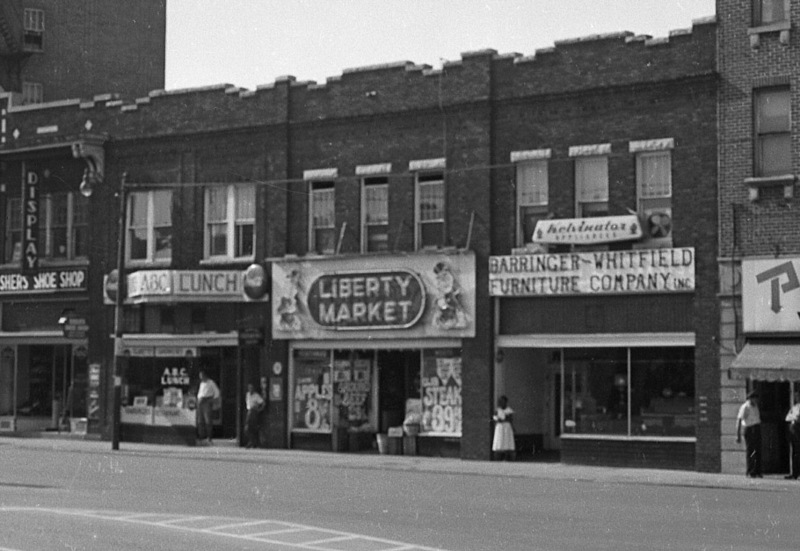 A 1950s era view that cuts off part of 347 West Main St., but shows the Liberty Market and Barringer-Whitfield furniture. These businesses remained in 1959. The row of structures remains remarkably intact today. As of 2011, 347 W. Main is home to Whiskey, a popular bar; 349 and 351 house offices. 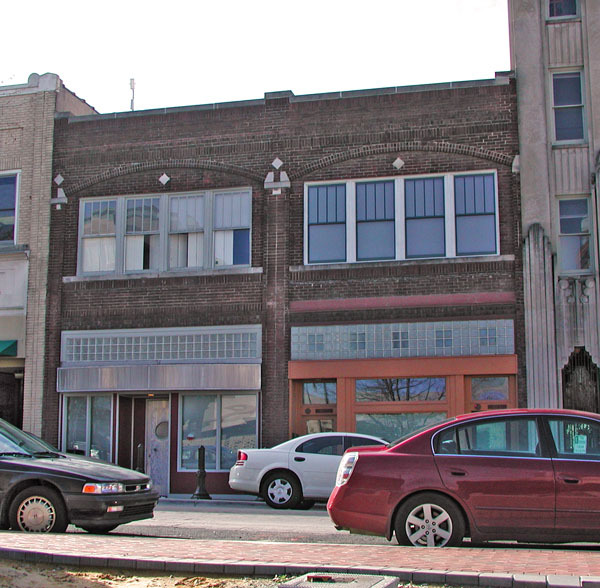 The building at 327-329 West Main St. was built during the 1920s with the C.D. 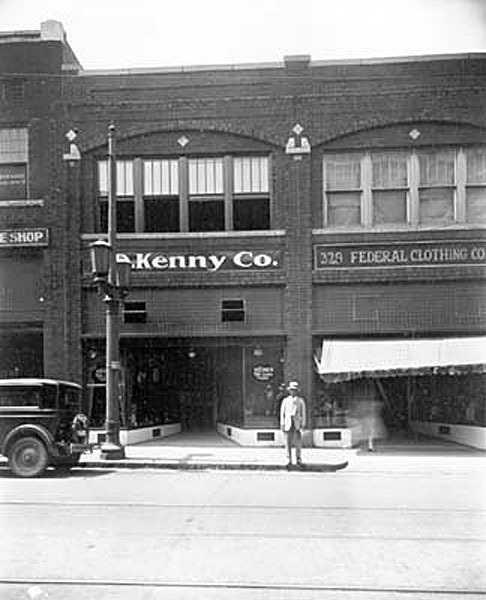 Kenny company (which sold Teas, Coffees, and Sugars) as one tenant and the Federated Clothing Store as the other. I've previously posted on another location of the CD Kenny company, 301 West Main St. 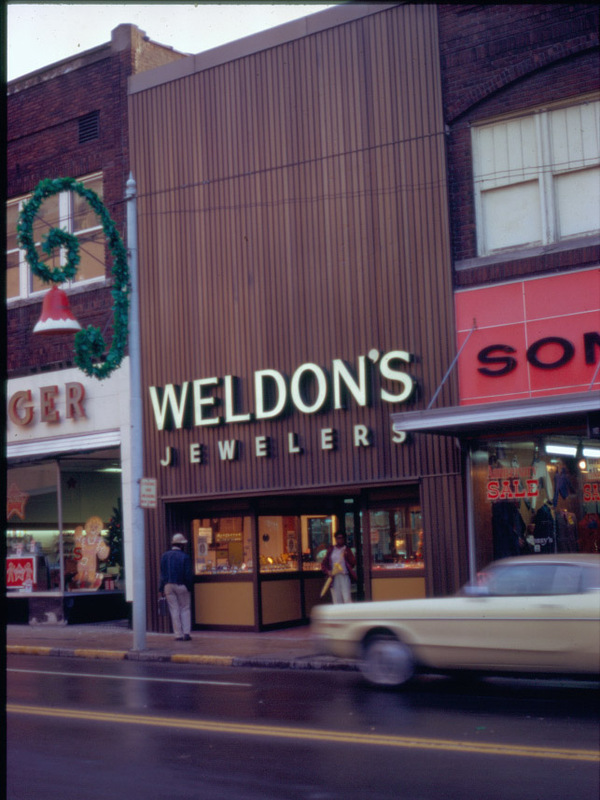 In keeping with the concentration of retail stores near Five Points, this building continued to house retail tenants through the mid-20th century, housing "Weldon's" and "Reed's" during the early 1960s. 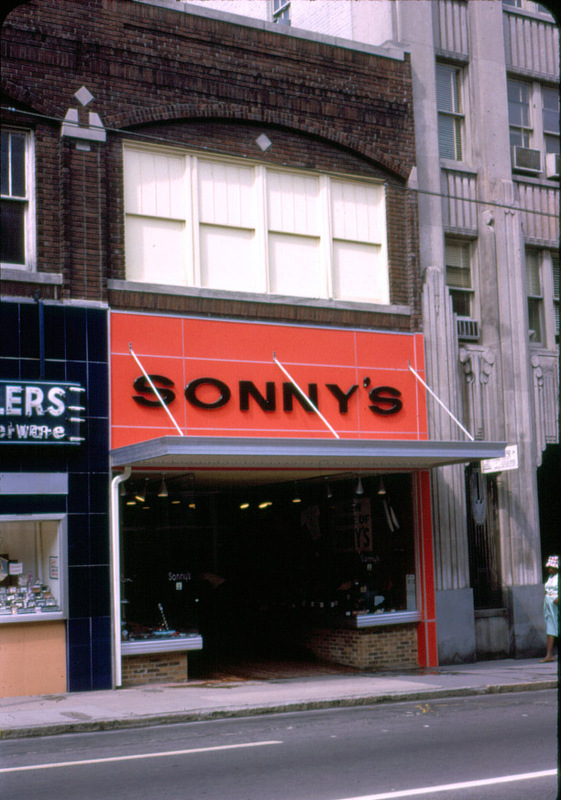 Reed's gave way to Sonny's in the late 1960s / 1970. 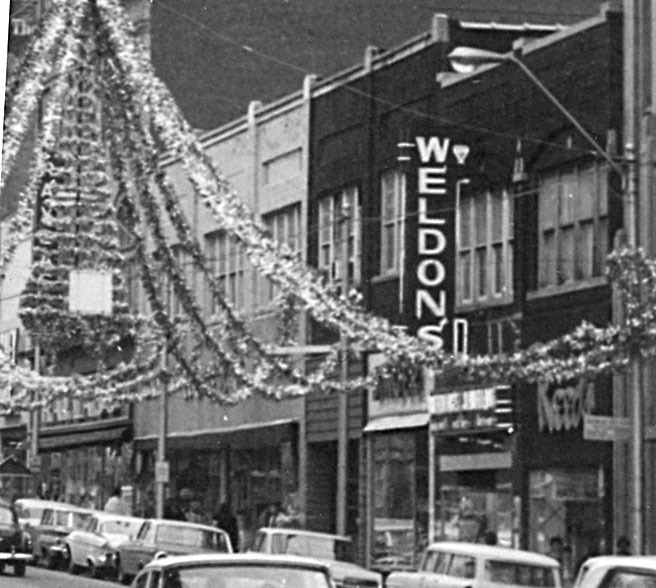 Weldon's received a facade 'improvement' in the early 1970s. Away abhorrent brick! This building has been renovated, (including, thankfully, the removal of its pseudomodern facade) and now houses offices - and, I believe, living space on the second floor. 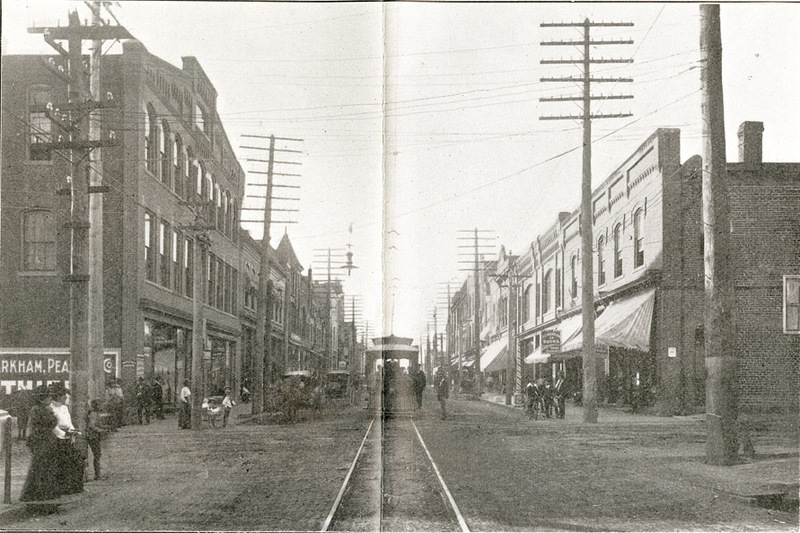 As with many of the structures on Main St., 317 West Main began by providing space to multiple small retail establishments. 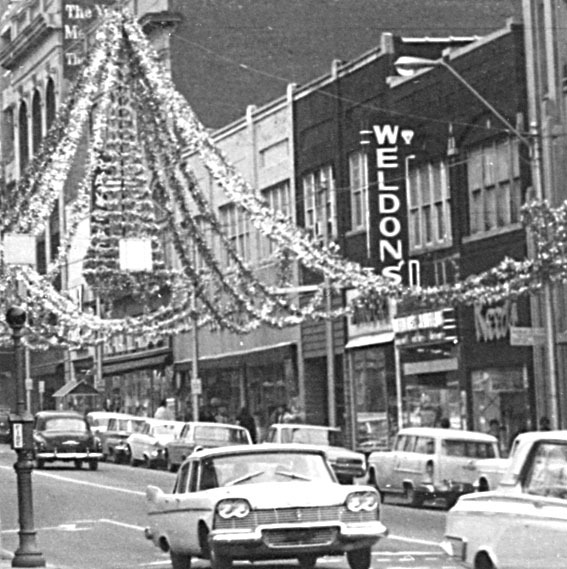 By the 1960s, many of stores on Main St. had grown to take over several of the spaces. Rose's has taken over the eastern 3 storefronts, while another business remains in the 4th. 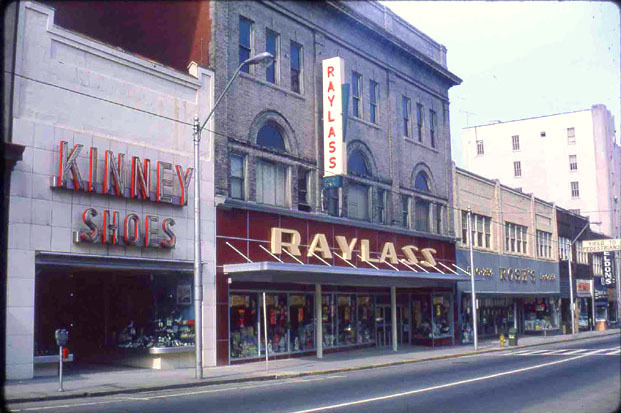 These businesses then closed down and moved out to the malls during the late 1960s and early 1970s; their large storefronts were dismantled. And the storefronts have returned to individual use. This building is divided into condominiums. I also find the brickwork curious on this building, as it appears dark in the oldest picture, and then the eastern three sections appear light during the 1960s, while the 4th remains dark brick. At this point, all 4 sections are light. Although I suppose it is likely painted, it doesn't have the appearance of paint. 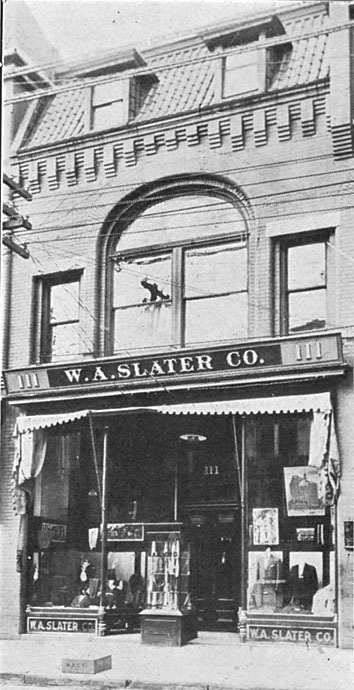 The building at 104 West Parrish St. was constructed in 1908. 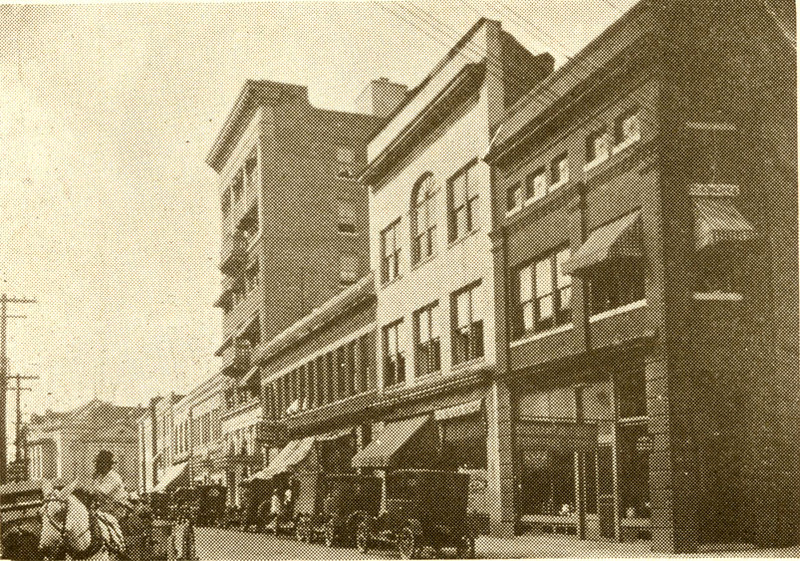 West Parrish from Orange St., looking northwest, 1922. 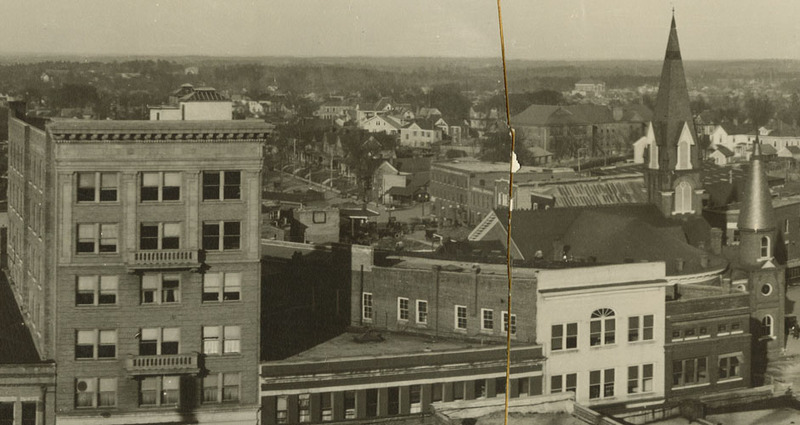 A bird's-eye view of Parrish Street, looking northwest, 1924. 106 West Parrish, the brick building on the northwest corner of Orange St. and West Parrish, was built by William P. Clements for his office. According to a publication by the Merchants' Association, he was "an extensive dealer in real estate." 108 West Parrish St., immediately to the west of the Clements building, was built by the North Carolina Mutual and Provident Association to provide additional office space for their growing company. 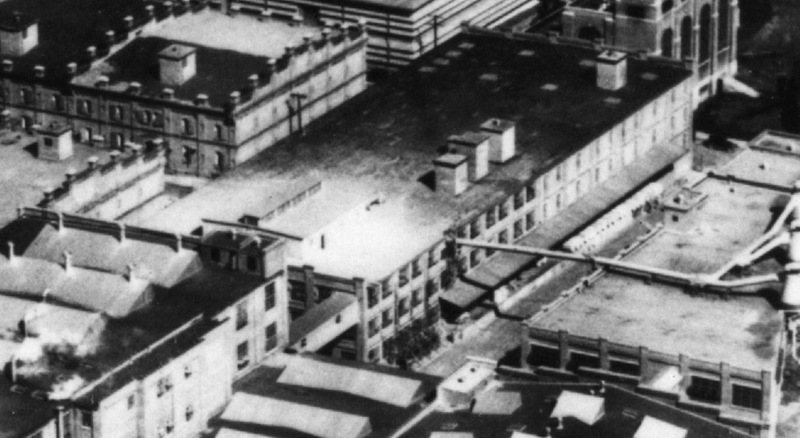 Above, a view of the upper floors, looking northeast, 1923. 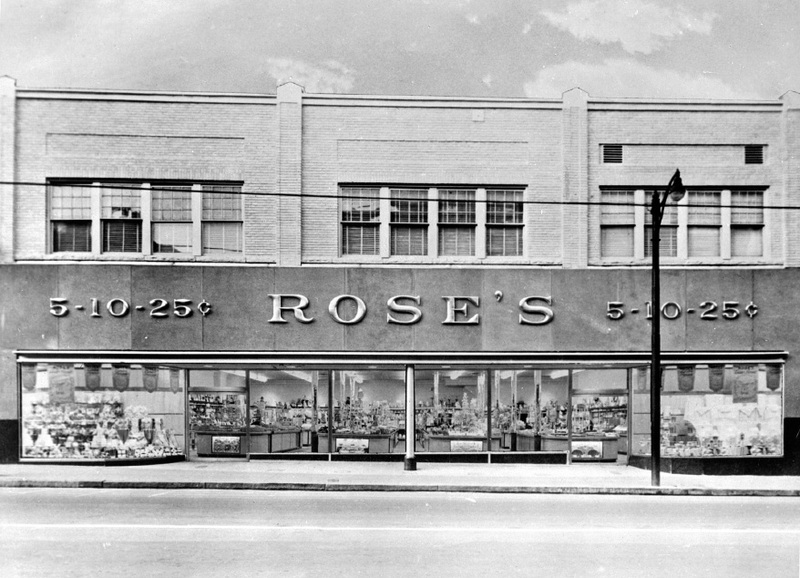 By the 1950s, Rose's Furniture had moved into these storefronts. Looking northwest, 1963. Orange St. is on the left, N. Mangum on the right. 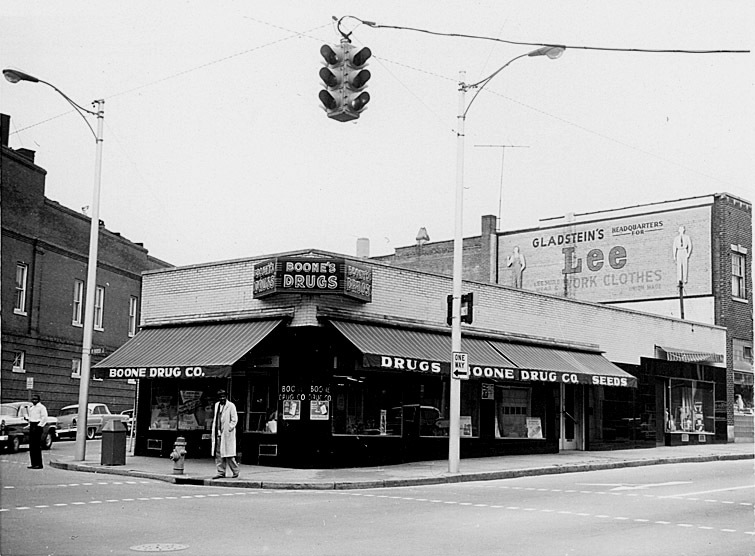 A partial view of the side of the Clements building is visible past Boone Drugs. 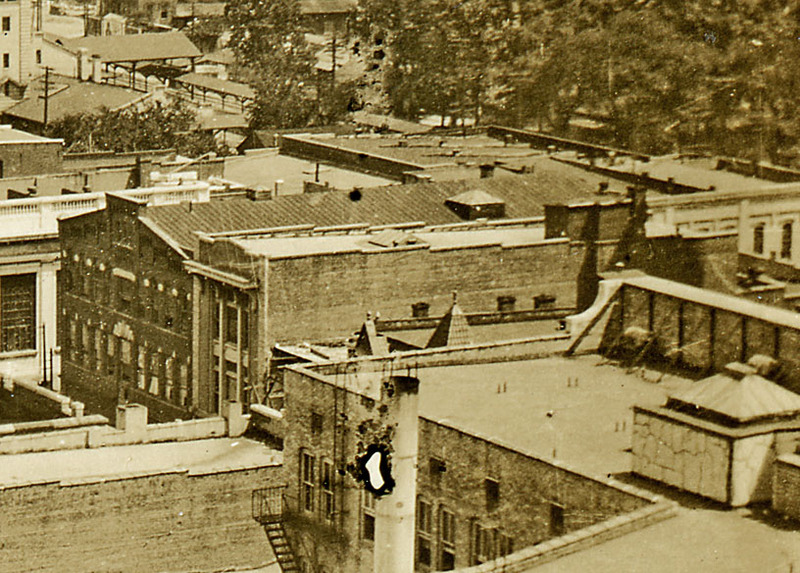 Below, a view of both buildings, 1962. Today, 106 West Parrish has been boarded/vacant for some time, but it has been purchased by Center Studio Architecture. 108 West Parrish contains both businesses and residence(s?). 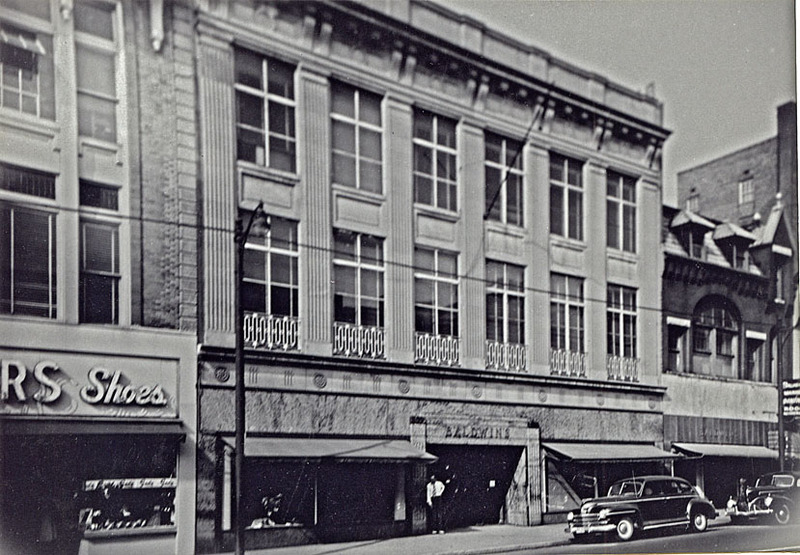 600 Foster St. was built circa 1958-1959 as a branch of the Home Savings and Loan. 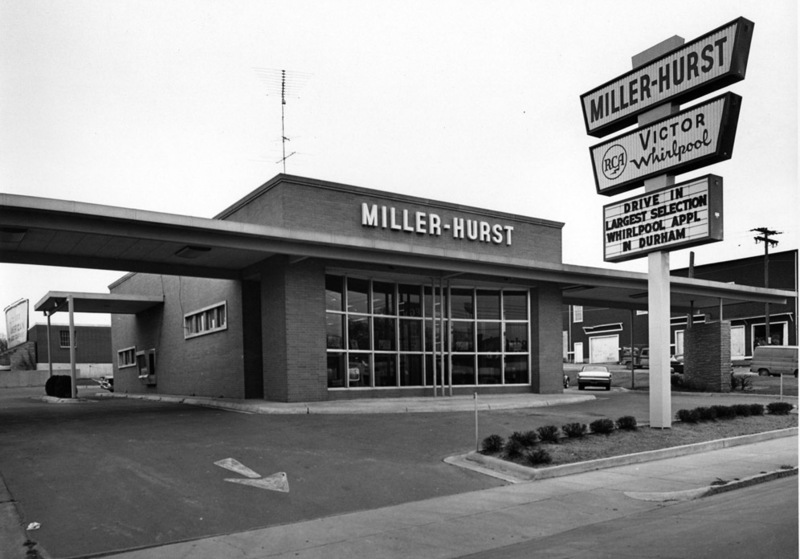 By the late 1960s, the building had been re-purposed as an appliance store known as Miller-Hurst. By 1970, the building was definitely no longer selling dishwashers. This well-preserved mid-century modern branch bank was constructed about 1959 for Home Savings and Loan Bank at the northeast corner of Foster and W. Corporation streets. 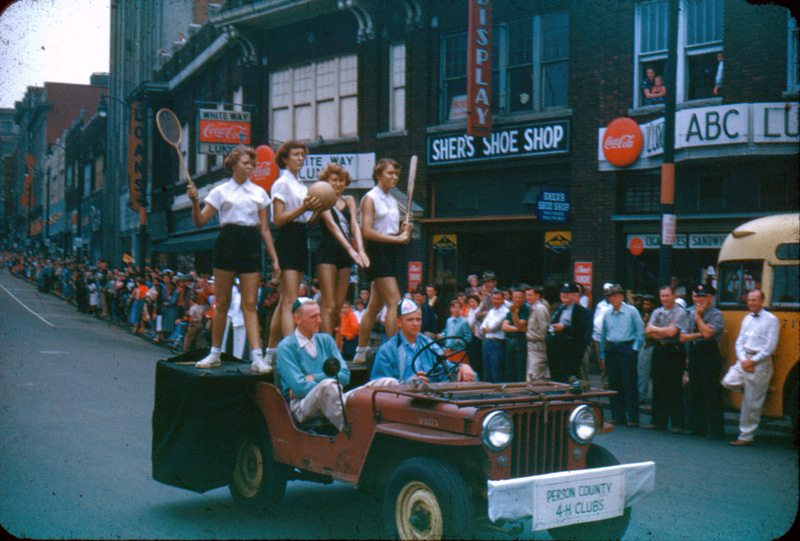 It does not appear in the 1959 Durham City Directory but is listed in the 1960 directory. Although it is a simple one-story, flat-roof, rectangular brick building, the unknown architect's treatment of the original flanking drive-thru entrances for autos elevated it to a dramatic example of modern suburban commercial architecture. A metal canopy stretches across the west-facing façade and is supported at each end by a curved orchard stone wall with a planter at the base and by metal pipe columns. Autos originally pulled through the canopy on each side of the building to drive-thru porte-cocheres. The main block is faced with orange Roman brick in a running bond, with an angled concrete coping. At the front and south side are large fixed-pane picture windows. The front window is concave. Other side and rear windows on the main block are smaller, grouped, fixed- and sliding-pane windows with wide concrete surrounds. The south side drive-thru porte- cochere is a flat canopy supported by metal posts and the window and wall deposit box are still in place. The front half of the building contains a tall-ceilinged open banking room, while the rear half has two levels of office spaces. [B]y the late 1960s the Miller-Hurst appliance store occupied the building. 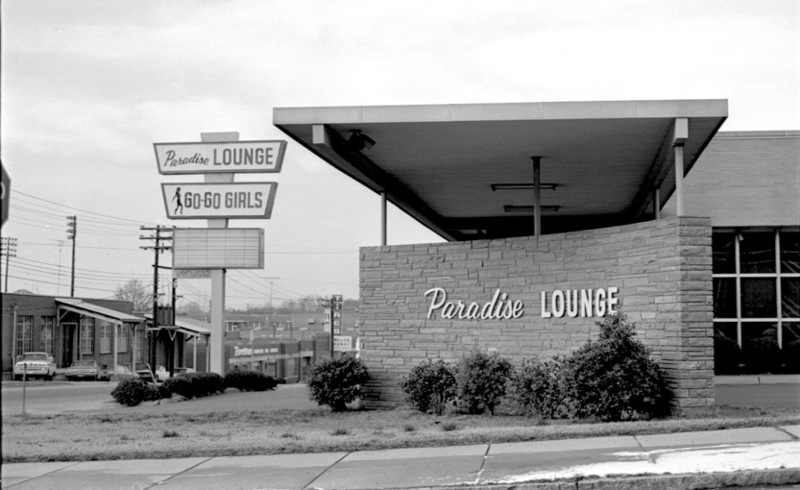 [B]y 1970 the tenant was the Paradise Lounge, advertising "go-go girls." Throughout these uses, the building retained its open canopy and two drive-thrus. 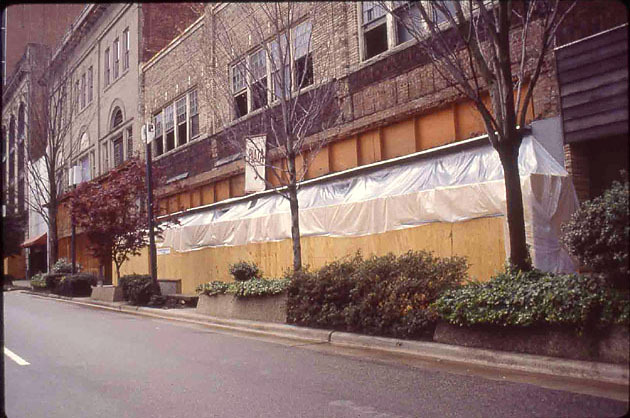 Paul Tesar's article on the building, "Wings of Eagles," (www.spectatoronline.com, Jan. 26, 2000) traces the building's later history as Coman's Hardware and Building Supplies from 1979 to 1997. Coman added an addition of similar design to the north side, behind the curved stone wall, which created a secondary commercial space in place of the north drive-thru canopy. The concrete block addition blends harmoniously into the façade because its front wall has a similar brick veneer and a similar full- façade plate-glass window and door. A second, lower-height frame addition was added to the east rear elevation. Architect Ellen Cassilly purchased the building in 1997 and converted the building to office space, including an office for her architectural practice. The interior of the original main block retains the open character of a bank lobby. Although one of the two distinctive original drive-thru canopies has been replaced with an addition, the building still visually conveys its bold modernist branch bank design because the canopy and curved stone wall and planter of the north drive-thru remain in place and the front wall of the addition is nearly completely glazed, thus the missing drive-thru is visually implied. From the intersection of Foster and W. Corporation streets, the building’s principal viewshed, the surviving south drive-thru is visible and the building appears to be unaltered. The Home Savings and Loan Bank retains sufficient integrity of design and feeling to be a contributing resource in the district. Like much mid-century modern architecture, this building demonstrates how architecture/landscape began to shift from orientation towards the pedestrian to the vehicle, most notably the advent of drive-through banking. But it also does so through the presumption that the primary entry to the building would be from the parking lot rather than from the sidewalk. Nonetheless, this building demonstrates how mid-century modern architecture can be beautiful as well, with a bevy of intersecting 90 degree angles and sweeping wing-like canopy? (not sure what to call it) supported/cantilevered by stone-faced, curved walls. Unfortunately, I think good mid-century modern design has often been lumped into the same pile with much of the rubbish that began to be produced in the 1960s and 1970s. Although it's rarely been the focus of this website, you can read more about the loss of modernist housing in the Triangle at the aptly named Triangle Modernist Houses.